Easy to Use, just apply and let dry…It’s that easy! • Safe on all glass and plastic surfaces! • Contains NO Silicone, Alcohol or Petroleum Distillates! 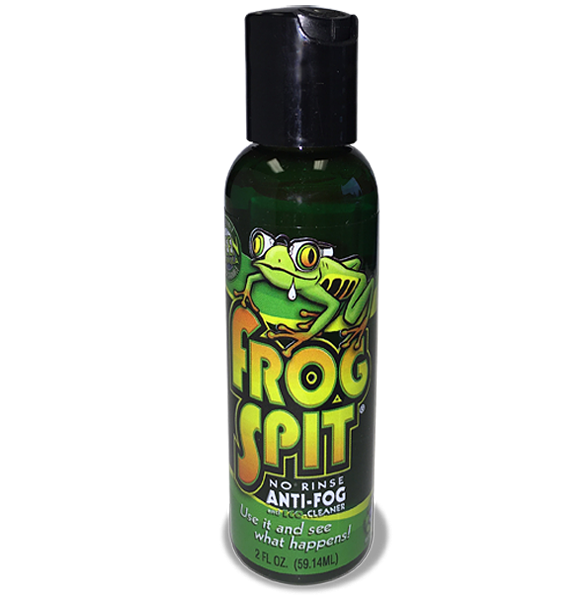 Frog Spit is a premium, multi-use, anti-fog specifically designed to applied and let dry. Evenly spreading a single drop on each lens surface is all that’s required to provide long lasting anti-fog protection. Frog Spit’s crystal clear eco friendly formula is safe, water soluble and biodegradable. Frog Spit also has a pleasant tropical fragrance and is safe and effective for use on all types of masks, goggles, face shields and protective glasses. It works equally well in warm and cold climates and is simple and quick to apply with NO RINSING OR BUFFING REQUIRED!